Vada - Software design, development & support. We understand the challenges facing community groups. We're a software and web services organisation with a focus on supporting the Community Services division of Australian Local Government Councils. Vada's approach to specialising in the community services area means that we have an exceptional understanding of challenges facing community groups. We understand that the establishment, management and maintenance of technology solutions needs to provide both ease of use and cost efficiencies to ensure that funding and resources are utilised efficiently. Our focus on providing solutions which offer easy ongoing management coupled with exceptional support services has proved to be a winning combination with our customers. Our team is what sets Vada apart from the competition. We have extensive corporate experience to bring you a professionally managed project which delivers results. We use best practice processes to ensure we work in synergy with our clients to deliver to expectations. Vada also offers certified trainers to ensure that you are exceptionally well equipped to take control of your solution from day one. Our products include HACCPAC and MEALPAC which are user friendly, cost effective and flexible applications allowing organisations to focus on the effectiveness and efficiency of care and meals delivery, rather than being hindered by time consuming IT and administration tasks. Our services include technical consulting and customised software development encompassing design, technical evaluation and implementation. 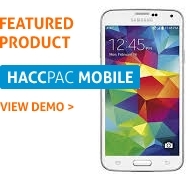 HACCPAC The essential software helping organisations care.